Such quick growth, while exciting, often comes with unintended consequences. 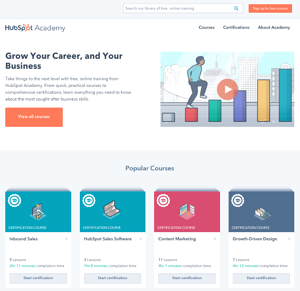 As HubSpot Academy grew, so did our website – we host thousands of landing pages for our free online courses and multiple microsites to support individual programs like the Education Partner Program and HubSpot User Groups, all of which exist in multiple languages as well. That's why we’re excited to announce today a new global look and feel for the HubSpot Academy website, as well as improved navigability and personalization to enable website visitors to find what they’re looking for as quickly and easily as possible. Visitors will now find a simplified navigation, smarter content filters, and a UI designed to make content discovery easier. To see the new website, please visit HubSpot Academy at https://academy.hubspot.com.